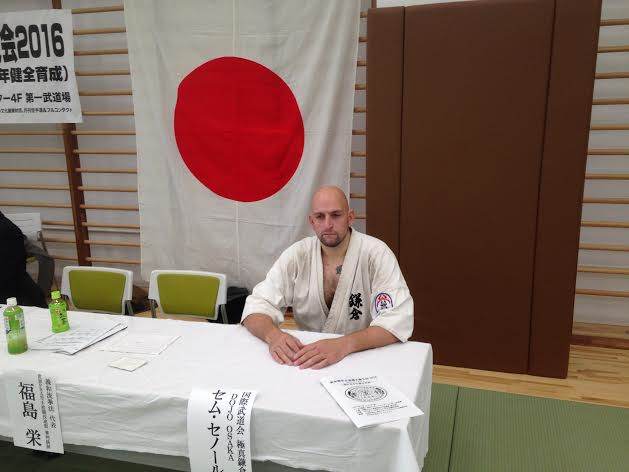 International Budokai's travel throughout japan. I have always been fascinated with Japan, when i started in the Kamakura dojo and heard the stories of Kancho Gordeau and his brothers Hanshi Nico and Shihan Ally. I was hooked. But we al know the disapointing sides of fighting in Japan like judging and dictator like organizations. After fighting here a couple of times and visiting Many times i wantend to see for myself what the situation is now a days. I asked Kancho and he told me: go and see for Yourself. Visit friendly organizations and make new friends for Yourself and the International Budokai. Being trained in the "Gordeau" style and Knowing al my predesesors in the Kamakura dojo. I know that we can be Proud at our organization. My journey in Japan starts on a friday in january. 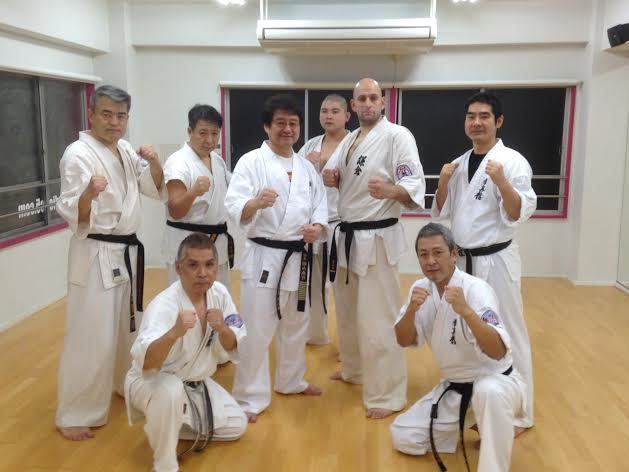 In the evening i have an appoinent to train with a Kempo style group called Kenshinkan. When i arrive, i get treated with hospitality . The training on this evening consists of balancing and self-defence exercises. After 20 minutes it is clear to me. The way of thinking difers from our way ( Kyokushin , Shidokan ). But that is great, because they see things from another point of view. In my opinion the first training was a succes. 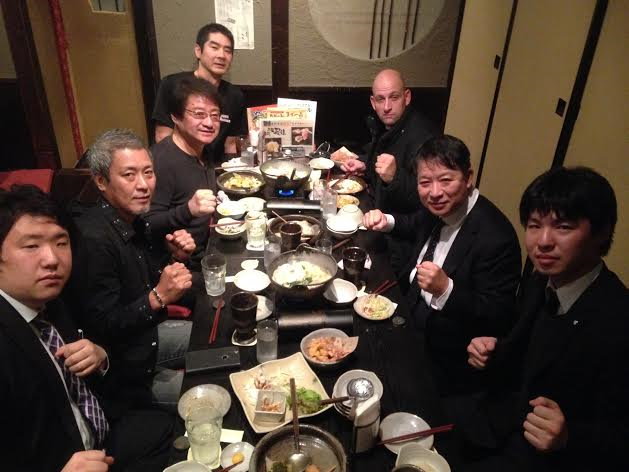 After the training Kancho Hayama and his group took me out to dinner and we had a very good time. 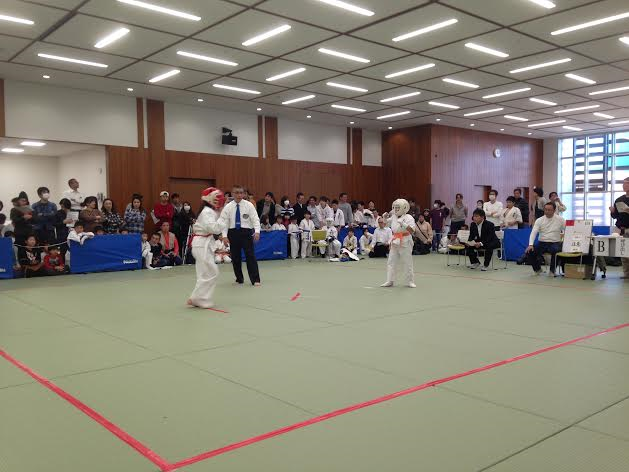 I was invited to a youth and beginners tournament in the minato region. When i arrived i was pleasantly surprised. First the location, it was a new multi-complex. A 8 story building with 6 floors dedicated to sport. And Guess what the designation of the 4th Floor was ? MARTIAL ARTS ! An entire Floor for martial arts. Some Parts where usable for al kinds, ranging from Judo to Karate and more. But Also space dedicated to weapon arts like Kendo and the traditional bow and arrow practices (Kyudo). There are country's that understand the need for diversity in sports. Then the tournament, it was a regional tournament with an good level of youth fighters. To my surprise there where a lot of styles attending this event ranging from Kenpo, Kyokushin and Enshin karate. With poules in different divisions and rules. The Kenshinkan organization was the host of this event. And they did a Very good job. For instance, there where 2 tatami's. Normaly that would be a ticket to a very late ending event. But no, it went smooth and fast. Fighting, result, Prize and a division done. O and it started on time, 10:30 is 10:30 and not 12:30. The way the people attending the tournament is crucial for the atmospere. Here when the lunch break started al the people sat down on the floor surrounding the tatami's and ate their lunch together. Normaly after a tournament the hall had to be cleaned by professionals but here everything was as clean as that it was when they came in. Al things considered it was not the fighting level that is different from our own, but the mentality that derrives from the Japanese culture that is. To my suprise i was invited and considered an official. To be honest i have never been in an official role, i am just a fighter trained by Gordeau. To make things even more exiting the asked me to do an Kata demonstration and a speech. So to Sum things up i had to be a representative of the International Budokai, hold a speech and do a small demonstration. For those of you who know me, I am not a role model representative. I am a fighter. I am no Kata man and certainly no public speaker. But as Kancho Gordeau would expect of me, i tried my best. Speaking of how we in the International Budokai think about things like coöperation with others and his vision about Kata. Al with al a good day with Surprises. All with all it was a great trip with good trainings and experiences. 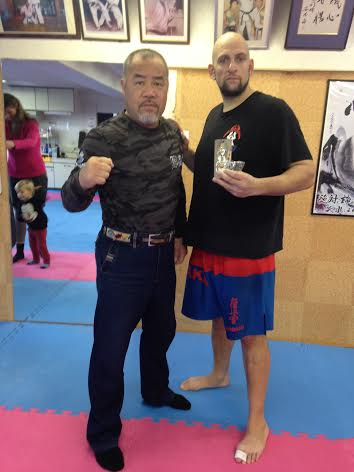 Special thanks goes out to Kuni, Osaka dojo's special friend in Japan. When i arrived in Osaka, i visited the Takao dojo. This dojo is one of four in the region. 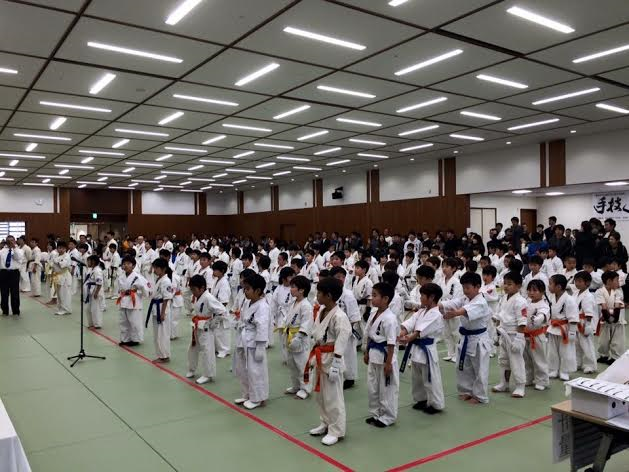 Chief of these dojo's is Shihan Takao. Shihan Takao is an highly experienced fighter from the days of francisco filho and Hajime Kazumi. His teacher is makoto Nakamura. With an excelent fighter record my expectations were high. The dojo i visited was a Japanese style dojo, in a street next to shops with kyokushin markings on the window. Just like any other shop that Belongs in an Osaka neighbourhood. 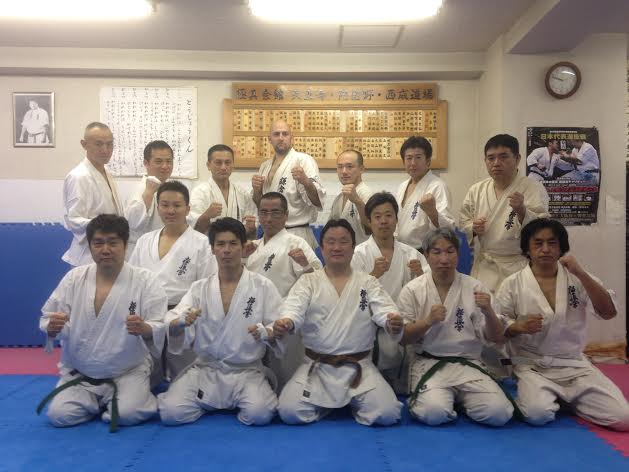 The training was wel balanced and the instruction quality was what you would expect from a Kyokushin Shihan. In the youth class, his instructions were wel explained and motivating. Exactly wat you need in a youth class. In the senior class, there was a high pace in kihon and Kata. The kumite part of the training was clear and wel instructed . Good explanation on techniqe and why is has to be practiced like this. After the training the group took me out to dinner where we talked about karate in Japan and raw chicken. 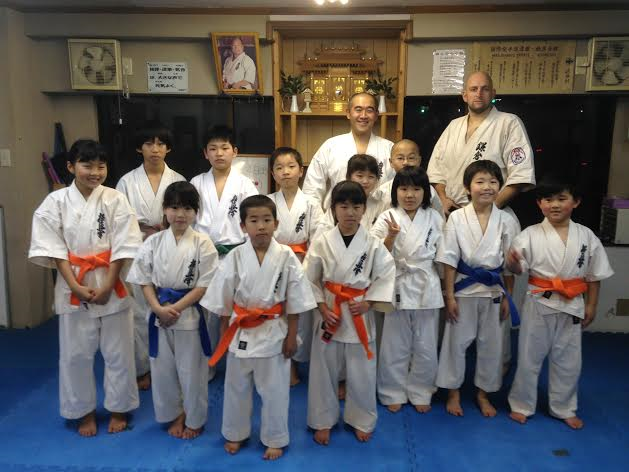 The next day i was welcomed in another kyokushin dojo in Osaka. The leader of this dojo was Shihandai Kobayashi, an student of Shihan Nakamura. The instruction was clear and interesting. The colourfull way the Shihandai explained the theory behind the techniques was with the same enthousiasm as Shihan Takao did the day before. A strong technical dojo with much experience. After Osaka it was time to head back to Tokyo. The next location i wantend to visit there was the zendokai karate dojo, in this dojo they trained a mix of karate en mma. Although they where Very friendly, it was a disapointing trip. They mantained a policy that non members can not participate in the training. These policy's are not unheard of especialy in mma and kickboxing dojo's. To bad because these policies and the Reasons that they are Being used has nothing to do with Bushido. 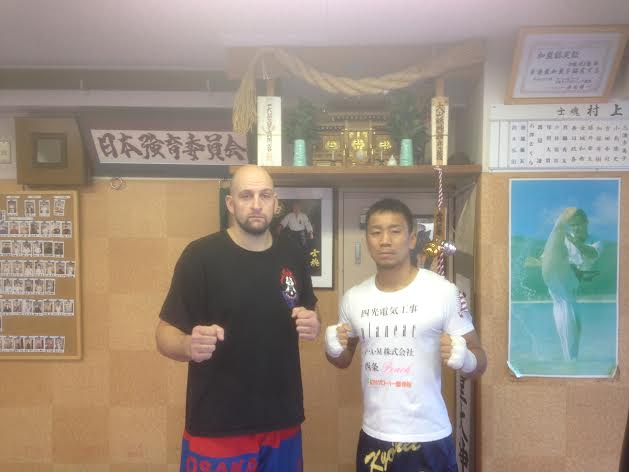 A pad training wit one of Japan's top fighters Kyohei Morizane. The training was quite diverse and Acompanied by our friend, organizer Krisztian Foldi the workout was Very good. Keeping in mind that the Murakami dojo is one of the best Shidokan dojo's in Japan. 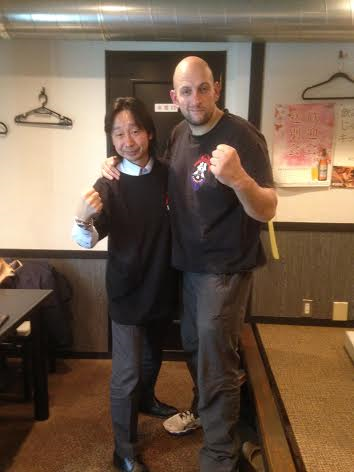 A submission Karate training together with Kancho Hayama was the goal of my visit to the Koenji area in Tokyo. A Very interesting training with techniques i already knew but Also new techniques. 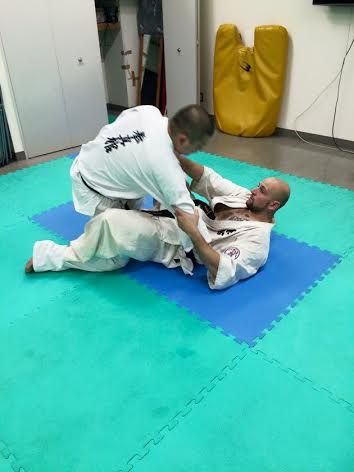 What was interesting in the training was the detail and attention to the way you ensure and initiate for example, an armbar from a top position. We are never to good for the basic views on techniques. His open point of view is a thing that we share in the International Budokai. Afterwards he took me and my family out for okonomiyaki, an typical Japanese dish that can be compared wit a mix of an omelet and a pancake. 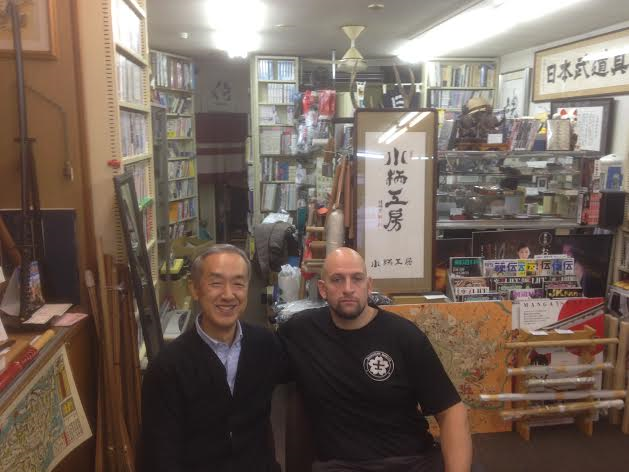 A visit to one of Japan's most famous martial arts shops, the Budo shop in the Ikebukuro neighbourhood. The owner of the shop, Yoshiki Kakuta is an old time friend of the Gordeau's. Years ago Kancho Gerard introduced me to Kakuta san. And since then when ever we visit Tokyo we als visit the shop. Except from having the best Kyokushin/ Full contact gi there is. The Budo shop Also specializes in Katana's and other martial arts suply's. What i personaly like is that whenever we visit we always have a talk, sometimes short sometimes long. We talk about the martial arts situation in the past and now. About the new generation and how Some things are different in our regions, we have a lot in common. 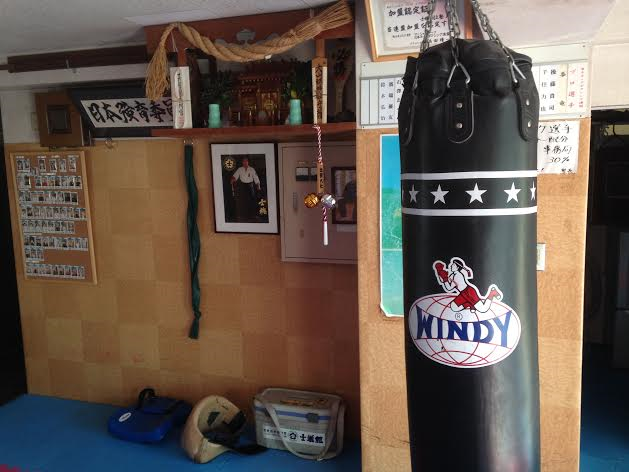 A training in the Murakami dojo was sceduled today. 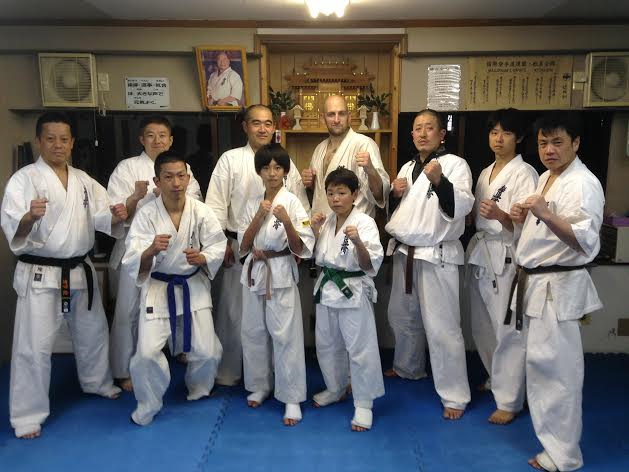 It was a great training given by Yukucho Murakami. Their technical view is Very practical and based on experience in the ring. So together with 3 other fighters we had a great workout that had everything in it, cardio, power, stamina and technique. They also had Some great souvenirs for in our dojo.